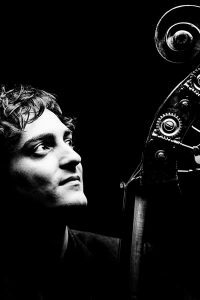 Double bassist, Nicholas Santangelo Schwartz is one of the most exciting double bassists of his generation. He is a laureate of multiple international competitions, including being the youngest winner ever of the International Society of Bassists Solo Competition and commission prize. He was also the first double bassist to win the Stulberg International String Competition and its Bach Society Award in its 43 year history. In 2013, Nicholas became a tenured member of the Royal Concertgebouw Orchestra in Amsterdam, widely known as one of the greatest orchestras in the world. He formerly played with the Berlin Philharmonic as a member of the Karajan Academy. In addition to being a long time member of the Verbier Festival Chamber Orchestra in Switzerland, he was guest artist at many international chamber music festivals with such artists as Anna Fedorova, Kirill Troussov, Benedict Kloekner, Eldbjørg Hemsing, and Maximilian Hornung. With world famous pianist, Anna Fedorova he has formed the “Oyster Duo” performing across Europe, Ukraine and the US to promote the double bass as a solo instrument. As a jazz bassist, Nicholas won his first international competition at Carnegie Hall at the age of 15 with the “Midday Jazz Quartet”, receiving the Grand Prize in the Chamber Music Foundation of New England International Chamber Music Competition. He has shared the stage with distinguished artists such as Mark O’Connor and Russell Malone and Clark Terry. In addition to his numerous concert performances, Nicholas enjoys teaching privately and giving master classes and is a mentor in the Royal Concertgebouw Orchestra’s Academy program. Originally from Brookline, Massachusetts (USA) Nicholas resides in Amsterdam, The Netherlands. Nicholas is a sponsored artist of Pirastro strings.